…And how can you help? Death. A topic we see and hear about too much in the world each day, yet a word we never want to think about. Restaurant Expert Witness, Howard Cannon, deals with some of the most shocking stories of death and injury on a daily basis. Mr. Cannon’s expertise is related to these events in the Hospitality Industry. So, how many deaths are in restaurants every day? Maybe you didn’t even realize you needed to ask yourself this question. However, the answer will surprise you. 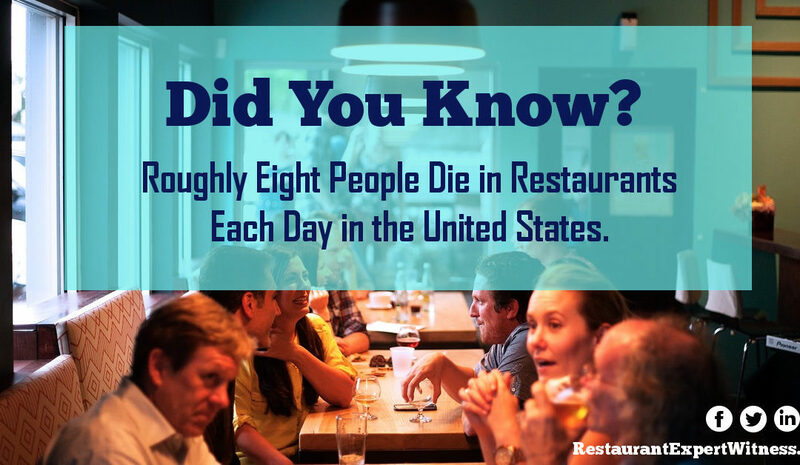 In American restaurant’s alone, an average of eight people die each day!! Multiply that by 365 days and you get a whopping total of 2,920 per year!! At Restaurant Expert Witness, we see it every day. But, with your help, a lot of these cases can be prevented. This is the purpose behind Restaurant OSHA Safety and Security. Our desire is to make America’s restaurant’s safe for employees, customers, vendors, and anyone else who steps foot in the door of a restaurant or bar in the United States. For more information on how OSHA applies to restaurant’s and bar’s and what you can do to help make your restaurant or bar safe for employees, customers, vendors, and anyone else who walks onto the premises, or to purchase a book or download a free sample of Restaurant OSHA Safety and Security, visit RestaurantOSHA.com. If you would like to know more about Restaurant Expert Witness – Howard Cannon and the services he provides, please visit RestaurantExpertWitness.com.